Need something more powerful than your delta fan? This is the fan for you. This 80mm fan pulls 84.1 CFM of air. True overclockers need unmatched performance that this fan delivers. This dual ball bearing fan flows up to 100% more air than a standard case fan. The only disadvantage to this fan is that it does produce a significant amount of noise. 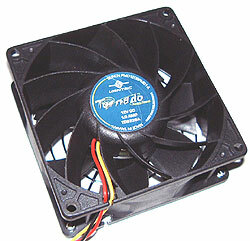 While the airflow/noise ratio is good for a fan in its class, it's bound to bother most people. To remedy this effect, we have a number of fan controls/noise dampening products available around our store, and we encourage you to take a look. Hooking this fan up to a baybus so you can turn it on low while you sleep, or adding a sound absorption kit may be to the best of your interest.